This powerful FREE script lets you run a full-fledged online business like the gurus. Step 1: Give away something that people want, in exchange for their email addresses. Step 2: When these people opt-in to your list, present them with a one-time-offer, aka OTO. It is usually a high value product at an insanely rock-bottom price. The conversion rate for a one-time-offer is usually 10%. Step 3: Run your own affiliate program and encourage your subscribers to refer more people to your site. Step 4: Follow up with your list, recommend more products to them and make more money in the future. How Do You Execute This Profitable Business Model? Just like a Wordpress Script that gives you a powerful blogging platform, you need a script that enables you to manage a list, present a one-time offer, process payments and provide an affiliate program. What Can OTO List Builder Script Do? Everything that is mentioned above. OTO List Builder Script allows you to get people to opt-in, offer them a one-time offer, send them preset autoresponders, mass mail them and let them make money sending traffic to you. It also has other features such as banner management and email ad management. How Its Affiliate Program Works? The affiliate program in this script is an instant pay system, i.e. your affiliates will get 100% commissions should their leads purchase your One-Time Offer. This saves the hassle of commission payments and refunds. It also motivates affiliates to promote your product. Your aim is to build a list, as big as possible. Money can always be made later via other promotions. Giving affiliates 100% commissions is a means to provide maximum motivation to your affiliates to promote your product. If you can't motivate them with 100% commissions, do you think 75% or 50% commissions can do a better job? On the other hand, if people are rushing in to promote your product, you should be happily making more money with other backend offers. This script is not child's play or a plug-and-play system. You will have to install the script to a server. It's your own website, your own business. PHP 5.3 or higher, compatible with any UNIX or LINUX servers. These are very basic server requirement. If you are not sure of your server specs, check with your server support. Do I still need autoresponder services like Aweber, GetResponse, etc? No. 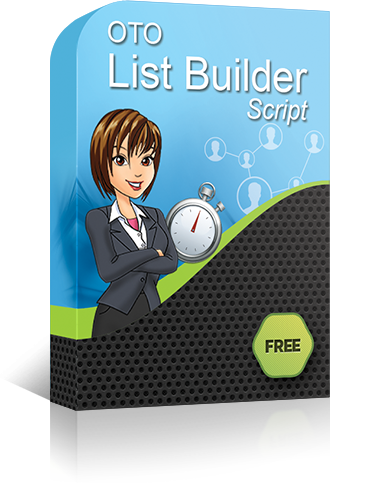 OTO List Builder Script itself is an autoresponder system. There is no need to spend money on third party autoresponder services. You need a desire to succeed. All other things can be learnt. No. I hate encrypted script because it limits customization. This script is open source. You can edit it and expand on it as your business grows. You need a server. That will cost you a few dollars a month (we don't sell server hosting, you get your own). If you already have one, you should be able to use the same one. In that case, there is no other costs involved. What should I do after downloading the script? Simply unzip the file, open a document called "installation guide.htm" and follow the guide there. Yes, but there is a norminal fee, just to cover our time. Honestly, we don't want to make money from this. We prefer that follow our detailed step-by-step installation guide. It's not rocket science. Just click the button below to download.